Shopping for fresh fruit and vegetables (photo: Elise Hassey). Cruising down the Mekong is a journey into the old heart of Vietnam, its rich culture and arresting landscapes. Legend has it that the Vietnamese people (Kihn), the largest ethnic group in Vietnam, are the children of Au Co, who sat on 100 eggs and smashed as many giants to protect them. It was the eldest of these children who supposedly inaugurated the Hong Bang dynasty, whose 18 kings ruled Van Lang, a kingdom in the Red River Delta, until around 257BC. This is an altogether more lyrical take on Vietnamese history than the story that many would know from the 20th century, when the country was ravaged by war. But Vietnam is finally emerging from its dramatic past and looking to a much more positive future. One aspect of this is the lure it now presents to travellers, with its rich cultural identity, exquisite cuisine and curious, welcoming people. With eight million people living in the country’s largest city Ho Chi Minh (all of whom apparently own a motorbike with a horn), one of the less frenetic ways to experience the country is via the mighty Mekong. At 4350 kilometres long, the river rises in the highlands of Tibet and empties into the sea south of Vietnam. Photographer Elise Hassey cruised the Mekong on Scenic’s Luxury Mekong cruise (from Ho Chi Minh to Siem Reap). Here, her travel diary of the Vietnam leg of the journey, and arresting images. We encounter a floating market selling pineapple, water melon, pumpkin, banana flowers and various fruit and vegies. 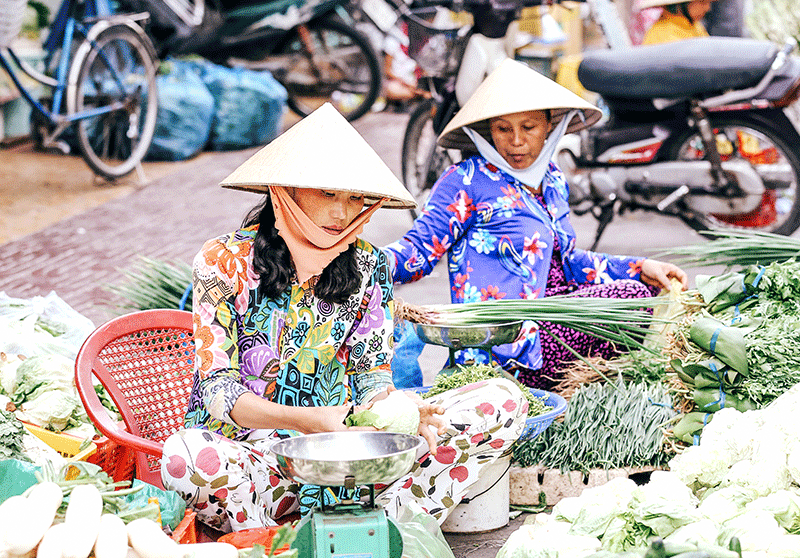 The Mekong Delta is considered Vietnam’s rice bowl, but it’s also its vegetable garden too. We catch a sampan [flat-bottomed wooden boat] to a village, strolling the streets and meeting the locals before touring the Ba Kiet, one of the oldest houses in Vietnam. One of the largest cities in the Delta, we spend the afternoon at the local market where they sell everything from toads, eels and water beetles to marigold flowers and vegetables. Everywhere I look there are men playing Chinese chess in the street, and motorbikes buzzing every which way; according to the Ministry of Transport, of the 90-plus million population here, 37 million have a registered motorbike. We catch a sampan along tributaries to Evergreen Island and glimpse authentic rural life. The village has between 150 and 170 families, most of whom grow chilli for a living; apparently every meal in these parts includes chilli. It is a humbling experience walking through the village, where everyone is so warm and friendly. At one point a group of children run out to say ‘Hello’, but hesitate at the last moment. Their grandmother tells them, “They won’t eat you”. As lunch approaches, women take to the streets with their mobile food shops. At a nearby house we watch a young girl practise traditional weaving. Before heading back to the boat we ride in a Xe Loi [tuk tuk] to the beautiful Cao Dai temple; it’s prayer time so we only stay a few moments out of respect. The Beautiful Cao Dai temple on Evergreen Island (photo: Elise Hassey). We watch fishermen catching carp and catfish on the way back and visit a local fish market. It’s an intense experience, much like the rest of Vietnam. It’s a country that undoubtedly has issues, from poverty to environmental damage as it forges forward, but what stands out are the people, and their respect and love for the river they thrive off. Can’t get enough of Vietnam? 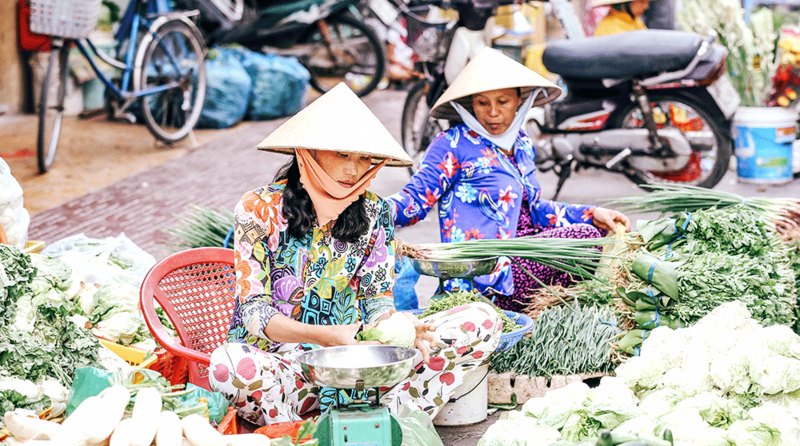 Check out the beginners guide to Vietnam.